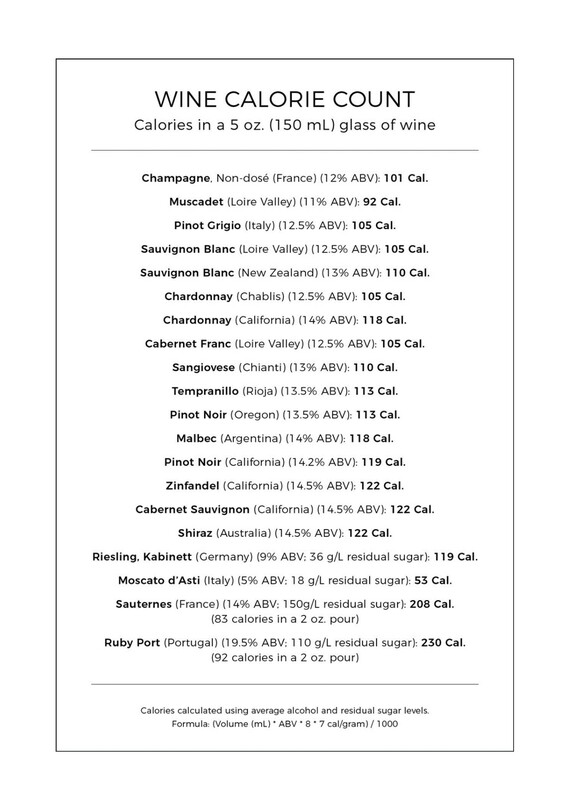 Are you confused about how many calories there are in wine? If you are health conscious you probably check the labels on food to check this. However the labels on wine do not need to carry such information. Each day, it seems like a new study goes viral referring to the various claims that wine can be healthy! For example: Alcohol lowers heart attacks! Red wine helps diabetes and memory retention! Wine can actually replace going to the gym! Wine lovers will use any excuse to sip more vino but, in reality, alcohol has calories that are not often factored into the daily diet — and they can make a big difference. Calories in wine come from two sources: alcohol and sugar. Of these two, alcohol adds more calories to the finished product, adding about seven calories per gram, whereas residual sugar adds about four calories per gram. Therefore, it’s important to pay attention not only to the sweetness of the wine being consumed, but the alcohol content as well. 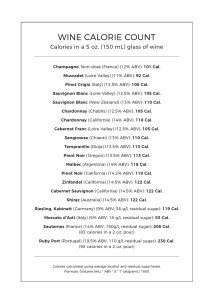 A dry, low-alcohol wine will have the fewest calories, while a sweet, high-alcohol wine will have the most. However, since sugar has fewer calories than alcohol, a sweeter, lower-alcohol option is often a better choice than a drier, higher-alcohol wine. Pour size is also something to keep in mind. A five-ounce, or 150ml, serving accounts for about a fifth of the bottle. With each additional drop, more calories pile on. Fortunately, fortified wines are the highest- calorie wines and are typically served in smaller pours, meaning that fewer calories may be consumed in the end. Curious as to how your favourite wine stacks up? Check out the calculations of classic dry, sweet, and sparkling wines below.